This month was a bit of a turning point for me. I landed my first book deal with a major London publisher. I was lucky enough to be recommended by one of their authors (Andrew Peters again) and they asked to see all my work and for me to do a sample piece for their project. After having my fingers crossed for what seemed like months they came back to me with the thumbs up! So I’m currently working on a four book series of children’s books. I’m not sure how much I can say about it so I’ll keep quiet on the details. But I’ll say it’s a monster story. So the years spent drawing gruesome monsters and dragons instead of paying attention in class have finally paid off. It would be my dream come true to be known as the monster illustrator guy. With luck I’ll do such an awesome job that they’ll want to use me all the time! I turned in the cover for Book 1 a few weeks ago and got some great feedback, and now I’ve just turned in the rough black and white images for the interior pages. Had a night off from work-work last night and stayed up doing a piece of fan art just for fun. 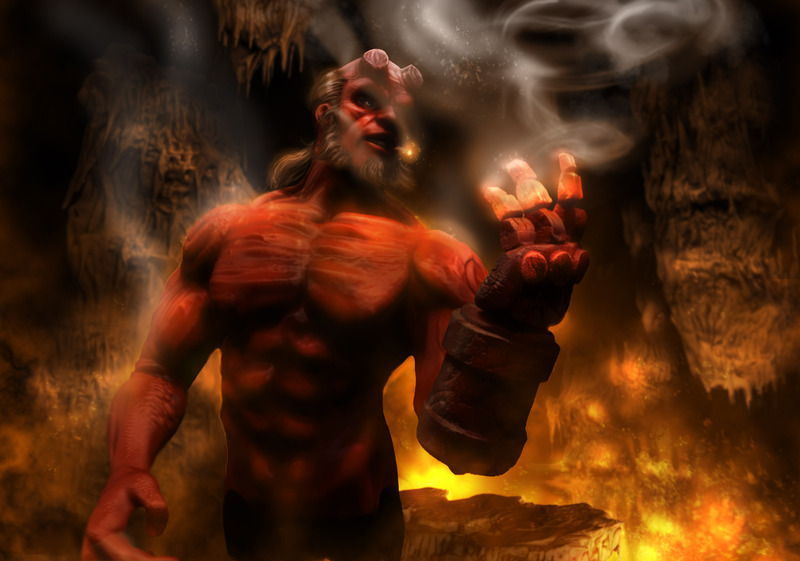 So here’s my Hellboy image. Some scallywag pointed out that I’ve put his gauntlet on the wrong arm and dang it, he’s right! I think I flipped the image at some point to check the composition, then forgot to flip it back. Now I’m apparently too lazy to open up photoshop and flip it once again.